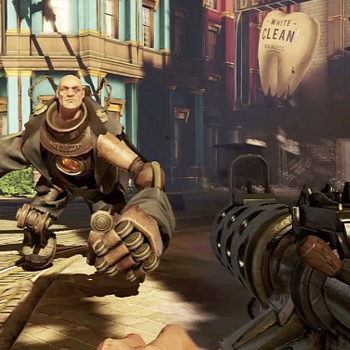 Ken Levine was often asked if BioShock could have been made without violence. In a recent appearance on NPR's "All Things Considered," BioShock creator and creative director Ken Levine discusses how he was often asked about the violence in BioShock: Infinite, and if the game could have been made without it. "Can you do it without the shooting?" He explains that he wasn't interested in making a game "without a gaming component to it." When asked if he's referring to the violent component he confirms that, "I wouldn't have known how to make a game like Mario. I wouldn't have known how to take this kind of story and turn it into a game about jumping on blocks, or a PacMan eating dots." He goes on to elaborate that BioShock: Infinite was used as a vehicle to move the discussion forward on the game industry's potential and expectations, "I think the reaction to the violence is more an expression of people building confidence in the industry's ability to express itself in more diverse fashions." Violence, according to Levine, is relatively easy to simulate and there's an established market for it, which is why most games choose to use it. The segment provides more interesting insights from Levine, like how critics were skeptical about the original game's potential, given it's subject matter. You can listen to the rest of his discussion on where the video game industry is headed here.